A 1937 article by Alexander Schapiro, criticising the nationalist rhetoric used in an editorial of Solidaridad Obrera. The Spanish civil war saw a marked increase in nationalist sentiments expressed among prominent anarchist activists and in the movement's press, which corresponded to the recasting of the civil war as one of national liberation against the Moroccan, German and Italian troops fighting the Republic. 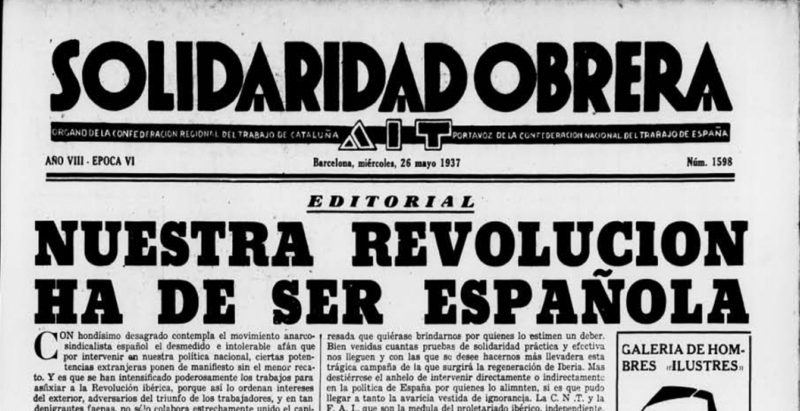 Prior to the CNT’s entrance into the Republican government in November 1936, the editorial board of the daily newspaper of the Catalan branch of the CNT, Solidaridad Obrera (‘Soli’) was removed. Among those who replaced the ejected journalists was Salvador Cánovas Cervantes, a proponent of a ‘racial’ understanding of Spanish anarchism who had previously been kicked out of the CNT after standing for election during the Second Republic. What follows is a 1937 article by Alexander Schapiro, a veteran Russian anarcho-syndicalist exiled in France. Schapiro had been increasingly critical of the CNT’s policies during the civil war, much to the chagrin of the organisation’s notables. The one-time National Secretary of the CNT, Horacio Martínez Prieto, described him in his memoirs as being, at this time, ‘the greatest enemy of the CNT’. This article is a response to an editorial in Solidaridad Obrera published on 26 May, which had, in a thinly veiled attack on Soviet intervention in Spain, indulged in appalling nationalist rhetoric. Schapiro’s counterblast was originally published in French in Le Combat Syndicaliste, the publication of the CGT-SR, and was translated into Spanish in order to be included in a dossier of offending articles by non-Spanish anarchists that was compiled by the National Committee of the CNT towards the end of the year. We know all about national-socialism. Sadly, we have done for a long time. In France a proto-fascist movement has recently appeared that calls itself national-communist. These contradictions in terms, mutually exclusive concepts united with a hyphen, have been more apparent than ever in recent years, producing the same nausea in us as everything else that brags about its ‘national’ character. Now there appears on the horizon, from the other side of the Pyrenees, a new ideology that we can think of no better name for than national-anarchism. 'The CNT and the FAI constitute a solid and powerful revolutionary movement that is quintessentially Spanish and quintessentially Iberian. Quintessentially Spanish and Iberian without being in the least bit nationalist… The impotence of the treacherous generals has brought about the direct intervention of Italy and Germany and this foreignization of Spain, brought about by the rebels, threatens to envelop the entire Spanish land. The CNT and the FAI form a mass revolutionary movement that advances with absolute homogeneity and which counts in its ranks a good proportion of the hundreds of thousands of men that struggle against the invader on all fronts of the battle-field and those that work for the war-effort in the rear. Faced by this danger, it announces its position, which can be summed up in the phrase: Spain for the Spanish! If it is to be desired that in the future Spain should constitute a political and geographical unit and a nation that contributes to the peace (!) and progress of Europe, the only viable solution is to allow this movement to put into practice its fervent desires and to work in such a way that the revolution that we all profess to struggle for might be of an eminently national character. Anything else would amount to covering with a false veil a young nation that has risen from the ruins of an execrable past to contribute the particular genius of its race (!) and its civilisation to the constant progress of humanity. In the first place, let us say that reading this panegyric on revolutionary nationalism brought to mind sad memories of the Hitlerite bluff of nationalism with a socialist basis – the socialist aspect to attract the people, the nationalist aspect so as to present themselves as the saviours of the country against internationalism.. It recalls in turn the Stalinist nationalism that puts ‘the fatherland’ above everything, in contrast to the first phase of the Russian revolution, which was fundamentally ‘internationalist’. Nevertheless, we will try to look behind the nationalist veil of ‘Soli’ to see what it is hiding. Those who went to Spain did so to help you in order that the revolution begun on 19 July might spread beyond its borders and inundate the entire world, country by country. For them it was not a question of race or of civilization, as with that logic we would be forced to conclude that the Spanish race is specifically revolutionary and that Franco and Mola (may God bless his soul) are revolutionaries in disguise, just like all the Falangists, Carlists and monarchists who are no less racially Spanish. Are we to consider then that the Italian race is fascist and that the Slavs are a race of Bolshevik assassins? We recall that our comrades in Spain had already spoken in Madrid in 1931 of how anarcho-syndicalism had been introduced into Spain –quelle horreur! – ‘in a beer barrel’, in an aside directed at our anarcho-syndicalist comrades of the FAUD in Germany. Nevertheless, such exotic origins have not proven an obstacle to the CNT in Spain proudly bearing the label of anarcho-syndicalist. To eulogise racism and disparage ‘exoticism’ are two simultaneous and complementary phenomena that indicate, to say the least, an anti-revolutionary state of mind, but where ‘Soli’ really loses it is in its declaration that Spain should contribute ‘to the peace and progress of Europe’. We know this phrase well, as it is often repeated by the politicians in France, whether they are Communists, Socialists, republicans or Crosses of Fire, that France (which must be for the French, of course) should work towards the peace and progress of Europe.. But, comrade anarchists and anarcho-syndicalists of ‘Soli’ and of the CNT, what kind of peace and which Europe are you alluding to? Surely not that which exists, just as you are surely not thinking of the democratic Republic of Spain?! So are you instead referring to the ‘social peace’ which will know of neither exploiting nor exploited classes in a Europe free from capitalism? If that is so, you must also think that the revolution must first carry out its libertarian task! And so the Spanish revolution (so named because the Spanish people have begun it), rising above any question of race, religion or class, will be the signal everywhere of a revolution against racist, religious, economic and political oppression. The Spanish revolution will become an international revolution, just like the French revolution of 1789 and the Russian revolution of 1917. However, the attitude adopted by our Spanish comrades, as reflected in the editorial in ‘Soli’ discussed here, suggests a liquidation of the social revolution in favour of a national revolution that could be nothing other than a formal political gesture and which is revolutionary in name only. Be on guard against chauvinism, latent in every man and in every movement that has not been able to rid itself of centuries of methodical and systematic poisoning. Keep a look-out for the dangerous cross-roads and cliff edges that await you, because the road that you have chosen, in spite of the lessons of the past and in spite of the doctrine in whose name you continue to speak, is chock-full of twists and turns that give way to an abyss from which there can be no return. Better to risk an emergency brake and a no less dramatic return to the great road that the CNT should never have abandoned. The mouthpiece of the CNT is unworthy of its duty, its voice is a shrieking falsetto that should come with ear-plugs. Time to change the record, and fast. Be on guard against chauvinism, latent in every man and in every movement that has not been able to rid itself of centuries of methodical and systematic poisoning.